To me, for example, The Beatles’ Second Album is the Fab Four’s Finest. But to the Beatles themselves it was no album at all — just Capitol Records’ sloppy attempt at housekeeping. The most-used image of the Torraca-era Fashion Jungle, taken in 1984 by Gretchen Schaefer. 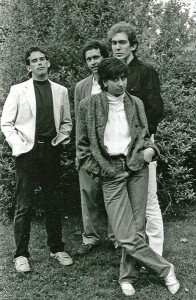 From left: Steve Chapman, Doug Hubley, Ken Reynolds, Kathren. 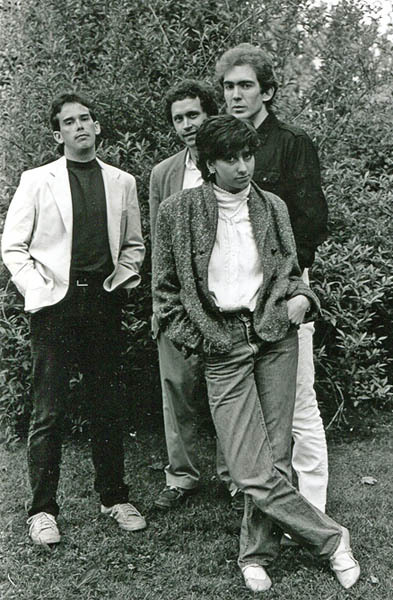 Looking at my own bands, the version of the Fashion Jungle that may be the most definitive for the most people (probably 25 or so) began during the winter of 1982-83. Although drummer Ken Reynolds, bassist Steve Chapman and I had honed the trio format to a fine expressive edge — and we rocked pretty hard too — we wanted more instrumental color. So when the opportunity appeared that winter to poach keyboardist Kathren Torraca from the Pathetix, we grabbed it. It was no bolt from the blue. For years I had known the Torraca family, a smart and accomplished bunch who today are involved in demanding endeavors like restoring vintage airplanes, raising excellent families of their own and practicing emergency medicine in war zones. I first met them at the Corner, that tendrilous social organism based at Patty Ann’s Superette, a family variety store in South Portland, Maine. They were teenagers when we met — I was a few years older — and were doing teenage stuff. Such as working after school at Patty Ann’s, making pizza and Italian sandwiches at the food counter tucked into the back of the store. 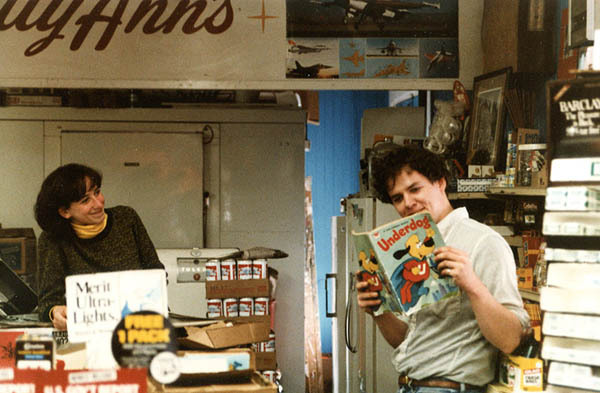 First Elizabeth Torraca and then her younger sister Kathren held that job, which resulted in a friendship that still endures between the Torracas and the family that owned the store, the Stantons — particularly Jeff Stanton, who is also one of my closest friends. But Kathren was very young in the film and I didn’t think of her as a potential musical colleague until 1982. Enjoying a steep and fast upward trajectory that fall, the three-member FJ was somehow engaged to play the “Going to A Go Go” gig described in Seth Berner’s review excerpted above. We opened the bill for the Pathetix, the Substance and the Neighborhoods, considered one of Boston’s best alt-rock outfits. The venue was the Portland Expo; in memory it seems as big as George Miller’s Thunderdome, but much more reverberant. Kathren Torraca and Phil Stanton hard at work at Patty Ann’s, 1982. Hubley Archives. The one song I can remember the Pathetix playing was John Cale’s “Dead or Alive.” But we were impressed with Kathren. 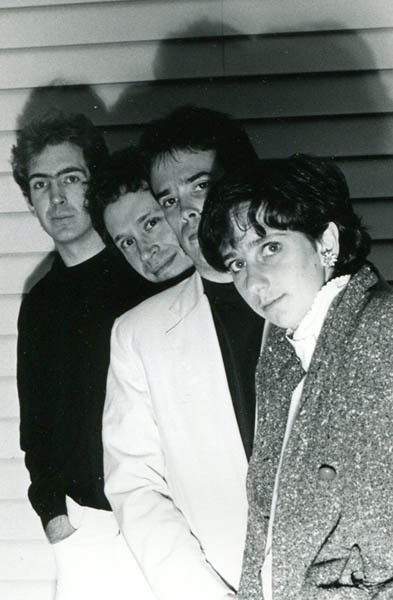 I’m not sure if “poach” is the right word to describe our asking her to join the FJ; I don’t recall any particular resentment from Gary’s band thereafter — but she was rehearsing with us by February 1983, and made her FJ debut in March or April. Steve, Ken and I liked to make jokes and laugh at them in that manly way that’s so much about distinguishing yourself against the world, since they’ve taken dueling away from us. But for Kat, as wry as she could be, humor seemed less about making some kind of statement and more about the sheer enjoyment of life. She was effervescent in a way the other three of us just couldn’t muster. Her musical contribution was transformative. She played the old Farfisa rock organ that we had acquired during the Mirrors days, but the Farfisa ended up serving mostly as a stand for her main axe, a Casio keyboard that I never got close to. I never understood how she got so many colors and textures, many of them quite mind-bending, from that fairly simple rig. Steve and I suggested parts to Kathren, but her musical sensibility was sui generis. It was painterly, often expressed in big washes of sound that billowed nicely around the hard-focused sound made by the boys of the FJ. And like Kathren herself, it was exuberant. At the same time, Steve and I were entering our most prolific songwriting period — bringing to our work, without even trying, a sense of high mystery and romance. The tumblers clicked into place and the massive door began to swing open again. As it turned out, Portland was ready for us. The first and last of these recordings were made during an April 1983 concert at the building at the corner of Market and Middle streets in Portland — once the Rathskellar (the Mirrors played there), then Ruby Begonia’s (I played there), much later the Big Easy (the Cowlix played there). (I think) the Neighborhoods — or was it Lou Miami & The Kozmetix? — on April 1, 1983. This was our second public performance with Kathren, who had absorbed part of the repertoire at that point. (She debuted with us at Kayo’s the previous month.) The mix comes off the soundboard and is quite good aside from a strange phasing sound and occasional swellings in the guitar signal. The middle five songs date from September 1983. Ken Reynolds is absent from these recordings, having broken his thumb in a softball game. Using Steve’s Yamaha drum machine, we used the opportunity to record much of our current material to document the keyboard parts for the next keyboardist — as Kathren had indicated her intention to leave the band. A false alarm, as it turned out. 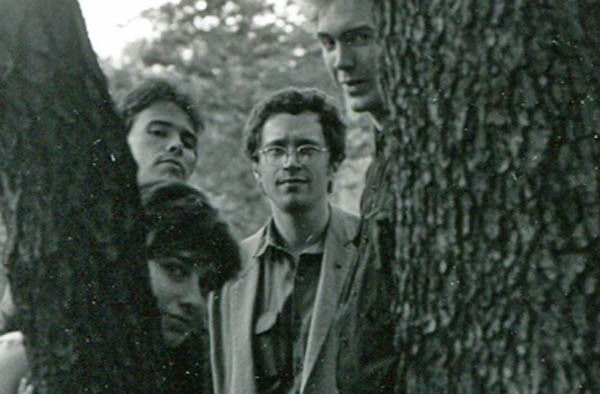 Personnel: Steve Chapman, bass; Doug Hubley, guitar; Ken Reynolds, drums; Kathren Torraca, keyboards. Vocals as noted. Ah, the romance! The mystery! The Fashion Jungle! Photo by Gretchen Schaefer. Censorship (Sullivan) We could do plenty as a trio, but Jim Sullivan’s protest against right-wing threats against free speech really needed a lead instrument. It was one of the first numbers Kathren learned. I sing it. Sporting Life (Chapman) Steve apparently imprinted on James Bond at an early age, as evidenced by this evocation of Jet Set living, as well as by “Dial M for Mamba,” below. One of his early contributions to the FJ repertoire, “Sporting Life” started as a fast rocker and later became a slow ska number. Steve sings. A Certain Hunger (Chapman) I liked everything Steve wrote for the FJ, but when he brought this in, I was flabbergasted by its sophistication and appeal. It’s a psychological, if not literal, portrait of someone who understands only too late that his lover is some kind of vampire. Not, as it turns out, that he minds. Steve is the singer. Old Masters (Chapman) The last post featured a version of Steve’s second songwriting contribution to the FJ in which he laid a new (as in 2012) vocal on a 30-year-old track by the trio FJ. Here’s a version with Kathren and the drum box. Again, a Chapman lead vocal. Dial M for Mamba (Chapman) A ’60s spy fantasy from Steve. I remember confusion all around about the difference between the snake and the dance, but if your life is threatened, I guess a poisonous snake is more useful than a Latin beat. But we have the beat anyway, thanks to the drum machine. Don’t ask me where I got that accent . . .
Pleasures of the Flesh (Reynolds-Hubley) Ken and I wrote two songs together, this and “Entertainer.” In both cases, I wrote the music and he wrote the lyrics, which I edited. He also sang lead — but not on this recording, where my scratch vocal one or twice tries to conjure up some Reynoldish qualities. Sporting Life (Chapman) It’s back to the April Fool’s date — and the pre-Kathren portion of the set, to boot — for yet another version, crackling with musical energy and some sort of weird electronic phasing, of Steve’s song. “Censorship” copyright © 1981 by James Sullivan. “Sporting Life,” “Dial M for Mamba” and “A Certain Hunger” all copyright © 1983 by Steven Chapman. “Pleasures of the Flesh” copyright © 1983 by Kenneth W. Reynolds and Douglas L. Hubley. All rights reserved.